Getting in the groove in the digital realm has never been easier, now that American Audio has introduced the Encore 1000 and Encore 2000 dual CD/MP3 player/mixer units. Each of these exciting “all-in-one” combos includes everything DJs need to play and mix MP3s, CDs and CD-R discs like a pro in one affordable, portable, easy-to-use piece of gear. Both the Encore 1000 and Encore 2000 contain two playback decks for audio or MP3 CDs – one on each side -- along with a built-in 2-channel professional audio mixer that’s ready to connect to power speakers or an amplifier via XLR outputs. Both models also feature line inputs for hooking up external CD players, a mic input, and an auxiliary mini jack input on the front that’s great for connecting an MP3 player or satellite radio. With professional features like Balanced XLR Outputs, Touch Sensitive Scratching, Relay Playback and Q Start, the Encore 1000 and Encore 2000 make it easy for any DJ to elevate their performance to the next level. DJs will stay better organized and in greater command of their show too, since both models offer convenient tools like a large, bright LCD display that shows track/folder name, elapsed/remaining time, Auto BPM, Pitch and other important information. The step-up model Encore 2000 is a multi-media player that caters to DJs who have ventured further into the digital world, or would like to do so. 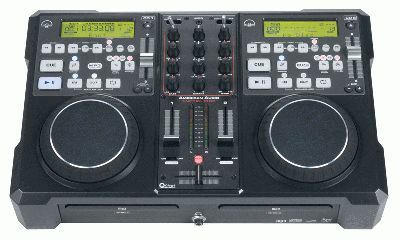 In addition to all the features listed above, it has a MIDI controller, which allows it to be used with a computer as well as discs. 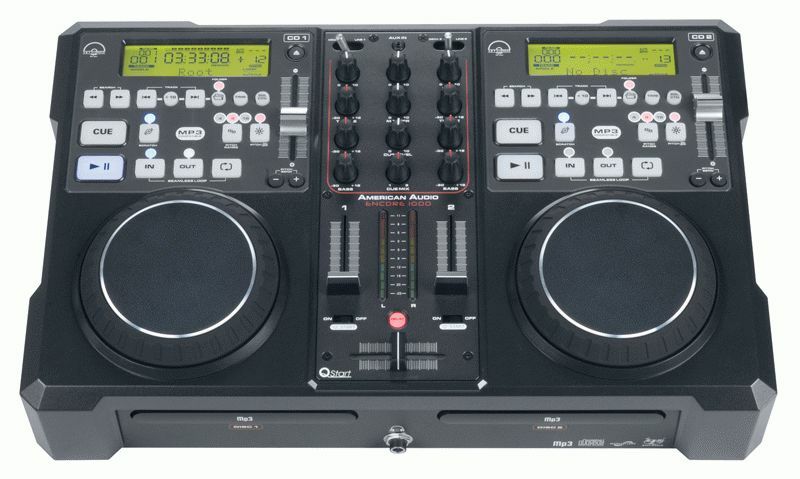 The 2000 model is equipped with two USB inputs for thumb drives or hard drives, and it comes bundled with Virtual DJ LE software so you can start digital DJ-ing right out of the box. It also features an MP3 cradle that mounts just above its auxiliary input, making it easy for DJs to play tracks from their MP3 player. Other features on the Encore 1000 and 2000 include Seamless Loop; Tempo Lock; Instant Start; a +10 Track Advance Button; Pitch Range (+/-4%, +/-8%, +/-16%); and Anti Shock (20 seconds per side). The mixer on both units has Bass, Mid Treble and Gain adjustment for each channel, as well as Master Level, Mic Level, Cue Mix and Cue Level adjustment. Designed for easy transport, each unit measures a compact 17.75”L x 11.25”W x 4.5”H/ 450 x 285 x 110mm, and weighs only 11 lbs./5 kg. Another travel-friendly feature is multi-voltage operation: AC 115-230V, 50/60Hz.